In the .Net Framework garbage collector manages the allocation of memory and release the memory of the application. Every time when the new object is created the common language runtime allocates the memory from the managed heap and as long as the address space is available in the managed heap, the runtime continues to allocate the space for new objects. As memory is not unlimited so the garbage collector performs a collection in order to free some memory. The garbage collector performs a collection which checks for objects in the managed heap which are no longer in use by the application and it performs the necessary operations to release the memory. It provides security of memory by ensuring that an object cannot use the content of another object. Managed heap is a sequence of allocated memory segments to store and manage the objects. When the new object is created the memory is allocated at the next available location on the managed heap, if there is any free memory available. 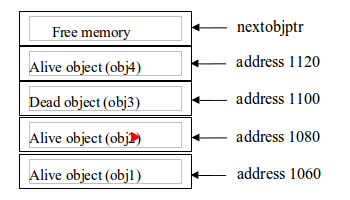 If the memory is insufficient to create the object, the garbage collector will search for the objects (dead objects) which are not in use to release the memory for the new object. Generation 0 for short alive objects. Generation 1 for medium live objects that are moved from Generation 0. Generation 3 have stable objects. When the object is created then the memory space is allocated which will be higher. That object will be in the Generation 0 and the memory allocation will be continuous without having any space between the generations of garbage collectors. Generation 0 – As this is the smaller generation and it contains the new objects. Generation 0 are short-lived objects and they are collected frequently. The objects which survive in the Generation 0 then are promoted to Generation 1. For example: temporary object. Generation 1 – In this the generation contains the objects which have survived for long in generation 0. Those objects which survive in Generation 1 are then promoted to Generation 2. This generation serves as a buffer between the objects which have short lived and long-lived. Generation 2 – In this the generation contains the longer lived objects which are promoted from generation 1 and are collected infrequently. For example: object at application level which contains the static data and is available till the duration of the process. Marking phase – In the marking phase it finds and creates the list of lived objects. Relocating phase – In this phase it updates the references to the objects which will be compacted. Compacting phase – This phase release the memory which is occupied by the dead objects and compacts the surviving objects. Garbage collection Event Tracing for Windows (ETW) Events. Out of memory exception is thrown. Process using too much of memory. Garbage collector does not reclaim objects fastly. Managed heap is too fragmented. CPU usage is too high during garbage collection. Workstation or Server garbage collection – The server garbage collection operates on the multiple threads whereas workstation garbage collection requires the multiple instances of the application to run its own garbage collection threads and compete for the CPU time. If we measure the garbage collection after the generation 2 the whole managed heap will be free from the dead objects. If we measure garbage collection after the generation 0 the objects in generations 1 and 2 will not be collected. If we measure before a garbage collection, then we can measure allocation as much possible before the garbage collection starts. Measuring in between garbage collection can be problematic, because the garbage collector data structures are not in a stable state for the traversal and may be not able to give the complete results. When we are using workstation garbage collection with the concurrent garbage collection, then the reclaimed objects are not compacted, so the heap size can be same or larger. When the physical memory load is too high then the concurrent garbage collection on the generation 2 is delayed. It determines whether the problem is caused by garbage collection. It determines whether the out of memory exception is managed. It determines that how much virtual memory can be reserved. It determines whether there is enough physical memory. MaxGeneration: In this property the class GC returns the total number of generations. In the above code the MaxGeneration property will return the highest generation in the garbage collection. It will count the total number of generations in the GC class which starts from 0. But in this code the output is maximum generations is 1.